Every 45 or so seconds he casts harsh lesson on a random target including the tank. In the room will be 10 undead mobs called expired test subjects, so you have to wait for all 5 of your group members to be teleported into their individual rooms. The doors of the rooms open when he casts another harsh lesson or there abouts. Group up or individually aoe your zombies within 20seconds after all 5 group members have been teleported. The adds can be kited easily they are really slow. We found it easier to wait in the rooms until all 5 party members had been teleported and group up at the last members door and wait for it to open/ wait for the adds to group up. This is so the people still on the boss can aoe down the 'failed students' that spawn through out the fight. My group did it by staying in the rooms kiting the adds till all 5 players had their own room to kite. Let your healer initiate his group 1st then every 1 else. He teleports random players into rooms full of Expired Test Subjects and Failed Students. When you get teleported inside, you can kill the Failed Students and run around until the door opens. The Expired Test Subjects will follow you outside. There are 10 Expired Test subjects in each room. Once you have 50 total, you can AoE them down for the achievement. The adds move very slowly, so can be kited by your tank. Even if your tank gets teleported, there is nothing that really needs to be tanked, as the boss just chain casts spells. The Prot Warrior tanked the boss in the middle of the room where he spawns. The Holy Paladin healed with RF on so all the adds automaticly jumped on him. To avoid any dmg on them, he kited the adds on the upper part while the shaman would ocasionally throw heals on the tank in case the healer would get overwhelmed. All the 3 dps stood about halfway on the stairs and dotted / chain lighting the Failed Students to avoid them going on the healer. Just AoE those adds. Warlock and Mage stopped the dps at around 20% to let the healer get all the adds. Once we had the 50 adds, the paladin just dispelled Explosive Pain. A tip for warlocks: if you place your teleport at the bottom of the stairs, no matter which room you get teleported to, you will always have your teleport in range and can immediatly teleport out of the room saving you the hassle of dealing with any adds at all. Edit: I guess the "downrate trigger happy" gang passed by. This achievement is a reference to James Patterson's Maximum Ride action-adventure series: School's Out—Forever. Like Yunaku said, this Achievement is in reference to James Patterson's Maxiumum Ride second novel called "School's Out-Forever." The series is about kids who were test subjects and come to find out that they all have an "Expiration Date." To get the achievement, don't immediately engage Expired Test Subjects after being given a Harsh Lesson. Instead, wait for everyone to be sent to their own room, then all engage the Test Subjects at the same time and /profit. 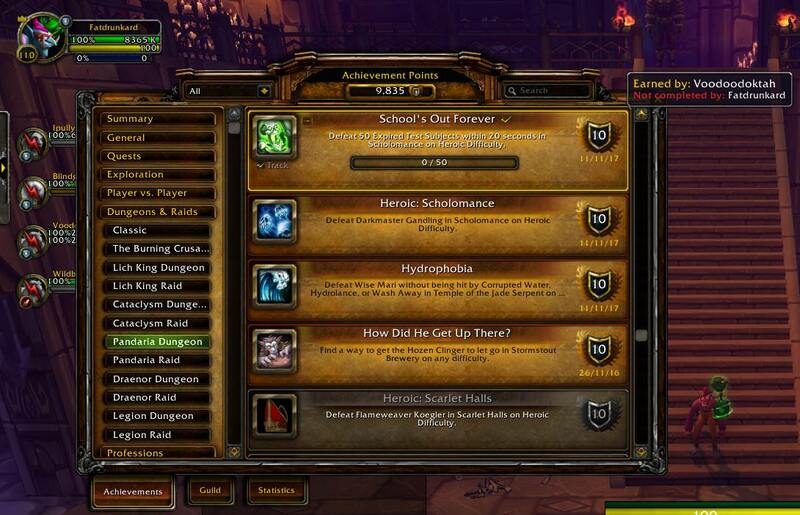 I queued for Scholomance as a DPS, then when we got to it, switched to Protection spec, and used abilities such as Piercing Howl and Mocking Banner to try to gather up the Expired Test Subjects without damaging them. We also got lucky this time, since he decided to summon Failed Students before any of the doors opened, and we could kill them without fear of harming the Expired Test Subjects. For this acheivement, class makeup matters less than how willing and able the group is to cooperate. A single person killing their Expired Test Subjects prematurely can ruin your attempt at the achieve. Additionally, it's possible to accidentally kill the Test Subjects; on two occasions, we gathered them all together, AOEd them down and found out that there were only 48 Test Subjects there. Since only 50 spawn, you can't afford to prematurely kill a single one, and since they have less than 100,000 HP, it's easy to do so. Patience, care and teamwork are most important here. Just tried to two man this boss and he does not cast Harsh Lesson more than once on the same target so you will need a group of five people to get this achievement. warning: Need 5 ppl for this achiev as boss teleport every person only once! 1. Tank taunt boss, and wait until all group get teleported. when somone teleported, just run from the zombies. Dont dps boss at all, don't dps adds with the name "Expired Test subject" at all. but u can kill any add that is not "Expired Test subject", just make sure to kill the far from the "Expired Test subject" adds, and don't use aoe. 2. when all get teleported, then all go out to boss same time, wait for all zombies to gather there and look (using the macro I'll write down here) if you have 50 "Expired Test subject" adds. then aoe them and get the achiev. to use the macro first press V to see enemy name plates. then when you click the macro button you will get the number of these in front of you. remember that with boss there have to be 51 adds. make sure all of them are "Expired Test subject" and not some other type of adds. if some adds are missing at the end and you don't find them anywhere, it means you killed some in mistake. wipe and try again. I can confirm that you still need a full party to be able to complete this achievement as of 6.0.3. Pretty easy achi as of patch 6.0 and onwards. The hardest part was finding 4 others willing to do the achi. When that was done you just have to wait about 4-5 mins for everyone to get ported in and then stack and aoe. Nowadays the challenge in this achievement lies in your ability to organize four other peeps to come and help out and make sure none of you screws up. After that though, its pretty easy! The biggest challenge at 100 is keeping the Expired Test Subjects (ETS) alive. You can't readily AoE down the Failed Students as you risk killing the ETS or Darkmaster himself, and carefully picking them off is a challenge in the 8 seconds before they explode, but if they explode among your ETS, the ETS will die. After trying a few different tactics, we hit on a way that was very effective. You need a pet class and your pet plays tank. We had three pets (2 hunters, 1 warlock), so we set them up in front of the boss. One hunter tapped him then eased him (w/ misdirect) down to 89% (he didn't seem to want to cast Harsh Lessons above 90%) and players started getting ported out. The ported players stayed in their rooms with their ETS, except for the pet players, who went far enough out of the room to set their pets on the boss: quick pet attack then passive and positioned next to Darkmaster to get on the threat table. They then moved towards the back of their rooms. When the Failed Students came out, they attacked the pets for 8 seconds and exploded. The ETS were never in any danger. Once the last Failed Student was down, the players met next to the stairs and we AOEd down all the ETS. Hey, presto, achievement. tl;dr: bring a hunter or warlock, have their pet passively tank while everyone else stays in their rooms with their ETS until after the Failed Students are summoned and have exploded, then kill them all. I wrote a macro that can be used to complete this achievement. You need to activate the enemy name plates by pressing "v", then use the macro. The total of enemies will appear in chat. Even though he used it for the other achievement, it can be used here too. Just have everyone gather in a corner, face away from the boss, and run it. Just got it with a group and the first time, I only counted 46.....some of the subjects didn't come out of the room, so we would have been short. So we reset and everything worked second time. Don't be surprised if he doesn't teleport you to the Expired Test Subjects rooms, I just finished it with 4 guild mates, and he never teleport any of us. Only the doors for the test subject rooms opened. We had to go inside and pull the mobs. Just wanted to let you know about that. Could be a bug from the new Legion pre-patch. Or the new mechanics. Cant be sure now. It still does not work solo and needs full 5 member party. When doing this achievement during Legion pre-patch, boss casted teleportation but no one got teleported. But gates opened like normal after each attempted teleportation, we manually gone in rooms and taunted them. 4 rooms opened, 5th room did not open, some mobs spawned again and we managed to hit 50 and got the achievement. Tried it recently with a group of 5 level 110s. He doesn't seem to actually port people any more. When the message appeared the door opened and they started coming out but we didn't move. We waited til they were all together after all 5 rooms had opened and nuked them. You may need to go in some rooms to agro them. Make sure you don't have them grouped on boss. We tried that first time and failed the achievement since not all 50 of them were down before the boss died. They have to die before the boss so group them up separate from the boss and then do it. 7.1 - Still can't solo it. I didn't even see him cast Harsh Lessons... I stood there and let him try to immolate me for about 5 minutes. None of the gates opened, and I was unable to click, or pass through any of them. As of patch 7.2 it's still not soloable. Hey guys. I found a way to solo this. You WILL need 5 characters total, preferably level 100+. I'm also not sure if this is fully within the rules of the game. First you fly your 5 characters inside Scholomance instance which you should've cleared up to the last boss already. AFTER, you simply put all 5 of your characters inside the boss room. A quick way to do this is by having WOW running twice. Alt tab every time one of your characters is in place and log into the new version to the second character, this will automatically log out the previous character. Once this is done you round them all up and aoe them down away from the boss,and then kill the boss. Enjoy your achievement! NOTE: In my limited experience this worked for all old WoW achievements which require multiple people. i payed 4 randoms 2k gold each to come and do this with me. not the cheapest way but i dont have very good patience. let them heal u once each or dispell, anything that gets them in combat then he will start teleporting people. as a monk i used the statue(ww or bm only) that aggros so i kept them safe and away from boss so we could do it. I've been having a hard time getting a group together for this achievement it's the last one I need for the meta. So if you need it as well please add my btag maybe we can get enough together. Serena#1262 I'm on US server Kil'Jaeden not sure that matters. Just updating since comments are so old. Yes you still need 5 ppl and yes everyone will be ported. Just make sure you unequip weapons or any trinket that might trigger. We designated left corner of stairs to bring adds down, when everyone had their 10 we just aoed them down. Was pretty easy. I am going to try this achievement this evening 27/04/2018 8:00 p.m. CET time (EU server), if you want to join group add me as btag friend #Stifmeister2532 or search for "School's out forever" in group finder from 19:30/19:40 CET. - Bring 5 people who can someway reset the boss, with Shadowmeld, or mage Invisibility. This is because the boss bugs out sometimes and doesn't teleport people, keeping the gates closed. Also in case you accidentally kill a mob before you have everything. You can all reset the boss and try again. We had 3 Shadowmelds and 1 mage, and we had to resummon our last member after each try we failed. - Don't forget to take off trinkets and neck enchants that could accidentally kill the adds or boss. I cannot stress enough how many times I've failed my achievements because my partner forgot to take off something that hits mobs when he gets damaged. - Lead all adds upstairs so you don't accidentally kill the boss when it's time to kill them. - Sometimes when the boss doesn't teleport people, he still opens the gates. Wait a bit and run into the rooms to collect the adds if this happens. Just completed this with a group of five. Using the macro Ylts mentioned above to count the mobs, we couldn't understand why we only had 40 even though we'd all been teleported. This happened on the second attempt too, so we went "sod it", killed the 40 mobs we had and got the achievement. This can still be done "solo" in BfA if you have 5 characters of appropriate level and an abundance of patience. I advise disabling all addons to make the many, many alt-f4/relogs go by much faster. You have something like 30 seconds between hitting alt-f4 and when your character vanishes, so if you can't get back in-game faster than that, all 5 characters will be offline at once and the boss will reset, making this strategy impossible. Other comments seemed to imply that your character would stay online for longer if you were in combat with the boss, but that's not the case as of BfA. Unless you're doing this with characters across multiple accounts, you'll never have more than two online at once. If you don't know how to get all 5 of your characters into the same group: create a custom group in the group finder, switch to another character, apply to the group, swap back to the original character to invite, swap back to the applying character to accept. Rinse, repeat. Log in to the leader, set your instance to heroic, zone-in and clear up to the final boss. Alt-F4 inside the final boss room. One by one, log in to the other 4 characters, zone-in, accept the 4/5 instance lock, run into the final room past the gate, Alt-F4. Once you think you're done, quickly cycle through all 5 characters one more time to make sure they're all in the final boss room past the gate that drops. If they were moved to earlier in the instance, you took too long to run them in. If you don't think you could have done it any faster, try running each character half-way per alt-f4/login cycle to avoid any one character being offline for too long. You can be offline for several minutes before being moved to earlier in the instance, so this shouldn't be much of an issue. Aggro the boss, alt-f4 and login the next character. Once the second character is in, you should see your previous character still online for a brief period of time. Since two characters are in the instance, one of them will be ported eventually. If the previous character drops offline before anyone gets ported, alt-f4 and log into the next character. This cycle will repeat over and over, with you logging in, waiting for someone to be ported or for the other character to drop offline, then logging onto the next character. It's important that you cycle through in the same order and that you switch to the next character once the previous gets disconnected. This makes it so there's almost always two characters in-game so that characters keep being ported, and ensures that no single character is offline for too long and sent back to the instance entrance. Once a character has been ported to each of the rooms, walk through and check each of the 5 rooms to make sure you have aggro on all of the Expired Test Subjects. Macros can't count past 40 for nameplates anymore, so another method to be super-duper sure is to collect them all in front of you, put a raid marker on one, and count to 50 while you tab through them. It should cycle through them in order, so when you get to 51, you'll be targetting the one with a raid marker again. Once you're sure, pile them up at the top of the stairs and kill them all at once. You'll get credit right away, no need to kill the boss. IF SOMETHING GOES WRONG: If you don't get credit because you missed a room or a few mobs, do not kill the boss! Alt-F4 in the bosses room, wait around 30 seconds so that all your characters drop offline and the boss will reset. Cycle through the characters once to avoid them being offline for too long, and start again. When I did this earlier today, a character was ported shortly after I logged in each time, so it goes by pretty quickly once you've set everything up and pulled the boss. Assuming you did the other achievements for Glory of the Pandaria Hero already, congratulations on your new Reins of the Crimson Cloud Serpent! 8.0.1 and we still have unsoloable dungeon content 3 xpacs behind the current xpac. The logout method with 5 100+ toons didn't work for me. The boss despawns. Unless you have 4 friends or guild with people who haven't done it, trying to get the mount associated with this set of achievements for the Glory of the Pandaren Hero is still impossible.